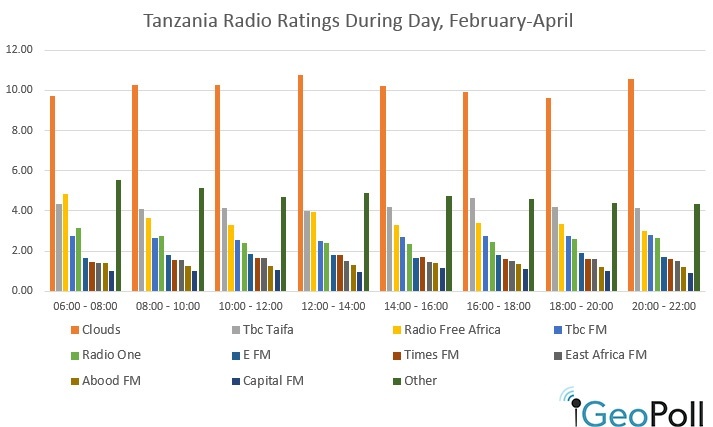 Using the daily data collected through GeoPoll’s Media Measurement Service, GeoPoll has analyzed the top radio stations in Tanzania and Kenya for the past three months, from February 1st- April 30th. We examined both ratings* and share** for the top stations in each country. The below chart shows the average ratings for the top 10 radio stations during the day, from 6am to 10pm. 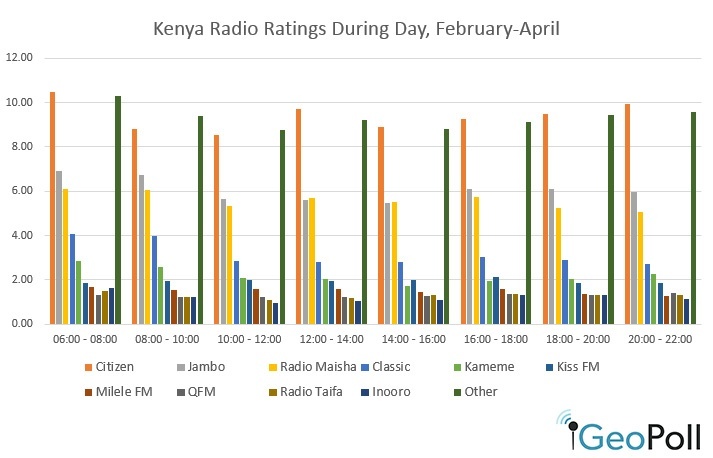 As displayed in this chart, the 3 top stations are Swahili stations led by Citizen Radio which has a sustained rating throughout the day. Jambo Radio has its highest ratings between 6 a.m. and 10 a.m, with a high average rating of 6.90 between 6 and 8 am. Citizen Radio also faces competition from “other” stations in the morning hours, which includes local stations and less popular national stations. GeoPoll also examined average share over the entire period from February 1st – April 30th. 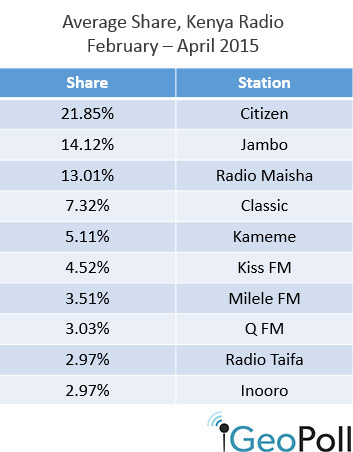 GeoPoll found that on average, Citizen Radio gets the highest share followed by Radio Jambo and Radio Maisha. These stations get almost 50 percent of the share. Full results are below. 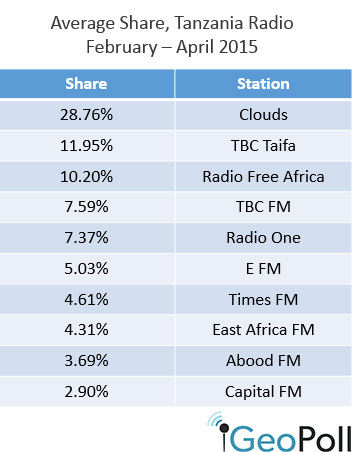 As displayed in the above chart chart, the 5 most dominant radio stations from February-April were Clouds, TBC Taifa, Radio Free Africa, TBC FM, and Radio One. Clouds is the leader throughout the day, particularly at the lunch hour with a rating over 10. Radio Free Africa is second in the morning, and then TBC Taifa is second for most of the rest of the day. In the morning is when the largest number of ‘Other’ radio stations are listened to. For share, GeoPoll found that on average Clouds commands over a quarter of the market share, while TBC Taifa and Radio Africa are closer to around 10% each. TBC FM and Radio One lead the remaining stations at around 7%. For more insights from GeoPoll’s Media Measurement Service, keep checking the GeoPoll blog, or contact us to subscribe to our daily media data. *Rating is the proportion watching a station out of the total sample at that time, multiplied by 100. If 50 people out of 500 surveyed watched Station X, the rating for Station X would be (50/500)*100) = 10. In Uganda, GeoPoll’s Media Measurement Panel includes a sample of over 500 respondents for every time period. **Share is the proportion watching Station X, out of all those watching at that time. This is equal to the proportion watching a station during a given time divided by the total number watching at that time.